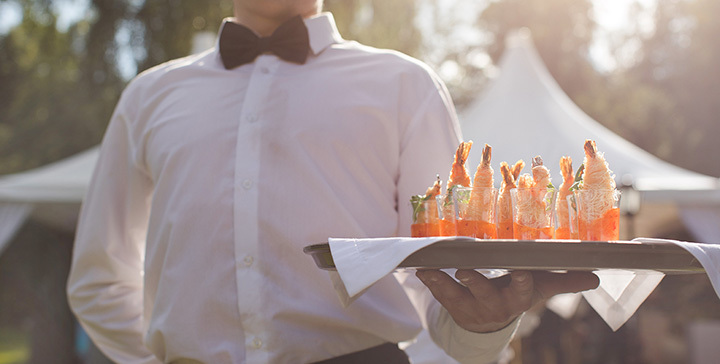 With the right catering company, all of the stress surrounding your next major event is washed away. Whether you need some down-home barbecue for a reunion with old friends or freshly-sourced fare for an elegant wedding reception, you’ll get it all with the 10 best caterers in Indiana. Here are our favorites. Everyone knows that the best place in Kokomo for catering services and delicious food is Rozzi’s Catering. For over 42 years, they’ve been providing Kokomo and other nearby areas with the best service and some of the best food one has ever tasted. They recently located to the Continental Ballroom off Markland, which has allowed their catering services to grow. Every Tuesday, Rozzi lovers can get their fix when they open to the public for a delicious and fun filled lunch which features unique comfort food from around the world. Looking to host an event off-site? No problem! Rozzi’s Catering offers off-premise catering for wedding receptions, corporate events, banquets, and open houses so give them a call today! A little bit of country in every bite is the motto at Shoup’s Country Foods in Frankfort, Indiana. What started as a small, custom processing plant has grown and evolved into a successful retail meat store, mail order, and catering business! Shoup’s is the leading catering and events industry in Central Indiana, and has been for over 15 years! The friendly and knowledgeable staff prides themselves on making each event warm and inviting to all, and providing some of the best food and service. Kahn’s Catering in Indianapolis is one of the best fine catering services in the area. Fine meaning they only use the freshest of ingredients, and because the service and the food speak for themselves as to how good they are. They cater to corporate events, weddings, special events such as graduations, and parties including birthdays, anniversaries, and more. Choose from one of their preferred venues, including the Montage with gorgeous panoramic lake views, the Eiteljorg Museum, the Indiana State Museum, Dallara Indy Car, Ima at Newfields, or choose your own special venue for your next event! With over 30,000 events under their belts, Indy Fresh has become THE place for catering in Indianapolis, as well as the surrounding areas. It’s catering to perfection with fresh flavor, a diverse menu, made to serve on the spot, quality ingredients, and affordability. Indy Fresh is all about supporting their fellow locals by working with local distributors and other local businesses throughout Indianapolis. Another great thing about Indy Fresh is their special dietary needs selection, which includes gluten-free, dairy-free, vegan, vegetarian and other options. Choose from seven different menus, including breakfast, lunch, appetizers, Italian, barbecue, and more! The Landing Catering has been northern Michiana’s premiere, full-service catering company since 1989. From the initial planning to the final clean up, this company has everything you need to make your next event a huge success. Owner and head chef Travis Hamel strives to create deliciously delectable dishes and creative menu items to reflect each individual event, all made with the best of the best of ingredients. They can cater traditional events such as weddings and corporate events, but they also specialize in tailgate services, graduation parties, class reunions, company picnics, and more. Any event can be customized so that it meets the customer’s needs because at The Landing, it’s all about the customer! If you’re looking for a catering service that specializes in delicious food and believes in recycling, look no further than One World Catering and Events in southern Bloomington, Indiana. One World Catering and Events offers professional trained chefs who prepare each meal with the freshest of local ingredients, and they believe in being kind to the environment by using sustainable materials and earth friendly practices. It’s all about the customer and providing outstanding service at One World to make your vision a reality. This special place also has dietary adjustments, which includes a custom menu upon request, and they cater to those who have dietary restrictions or needs (allergies, gluten-free, vegan, or kosher). If you’re looking for somewhere to have your next event, such as a wedding or reception, class reunion, or corporate event, be sure to check out the Orchid Event and Catering in New Haven, Indiana. Family owned and operated, the Orchid is hidden away on over 20 acres of partially wooded land with a six-acre lake just off the Lincoln Highway. The facility offers amenities such as LCD projectors and screens, sound system, wireless microphones, high-speed Wi-Fi, tables, chairs, linens and centerpieces—all inclusive. They also offer off-site catering, boxed lunches, and so much more. The Orchid is all about finesse and elegance with the rooms available for rental, including the Pavilion, the Orchid Room, and the Petal Room. They also offer a full-service bar and al la carte bar packages. In 1994, it was a small restaurant known as the Hoosier Café. Today, it’s Comforts Catering in St. John, Indiana. With over 40 years of experience as a chef, Chef Jack has taken the small catering adventure and turned it into something more, something better, and something that can meet the needs of any size event. With over 100 different selections to choose from, Comforts Catering has it all! They do “in home” functions, formal and informal (birthday parties, showers, open houses, graduations, etc.) as well as large corporate functions. The customer service is fantastic, and the food is even better! Dimitri’s Catering offers affordable elegance at its finest, along with professional and friendly service. Family owned and operated for over 30 years, Dimitri’s specializes in making your special event a one of a kind that will always be remembered. The menu they offer is a combination of traditional American, Italian and Greek recipes, as well as traditional Macedonian recipes for a little something extra. Choose from a delicious selection of breakfast, luncheon, evening, wedding and hors d’oeuvres packages, each with their own unique set of choices and flavors. Whether you’re planning a wedding, bridal or baby showers, memorial services, a simple picnic and more, be sure to check out Dimitri’s Catering! It all started with two sisters, a dream, a love of baking and cooking and meeting new people, and a love to please. Naomi and Ruth are two sisters who turned their passions into one of the best catering and baking services in north eastern Indiana. With handmade, time tested recipes handed down from their Amish ancestors and a healthy dose of trial-and-error, these two sisters have been dishing up food so good that their customers can only say “Wow!” For your next event, choose from a delicious selection of entrees including lasagna, stuffed chicken breast, beef or chicken and noodles. For a side dish, why not try some real homemade mashed or cheesy potatoes with a tossed salad? And for dessert, which is what these sisters are known for, try a delicious raspberry filled chocolate cake, homemade pumpkin rolls, or some light and fluffy lemon bars! No matter your choice, Dutch Heritage Baking and Catering is a must have at your next event!